It’s not easy being a leader, especially when the pressure is on and especially when everyone else thinks they know better and feel compelled to share their opinions with you. 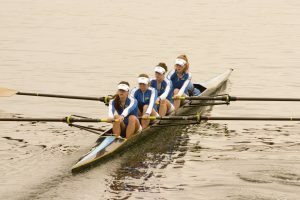 For this blog, I’m going to share some leadership tips from my experience of rowing. Actually, and more specifically, coxing. Coxing can bring with it some very high-pressure moments, especially during a race – there’s nothing like careering forward at speed, no brakes, poor visibility and 65ft of boat and muscle in front of you. You have to be aware of the weather, the water conditions, tide changes, potential hazards in the water, other crews, the course, the rules and at the same time, get the optimum boat speed from your crew. You can also expect to be shouted at from the bank, from other boats, from bridges and possibly also from your crew members. Coxing is not for the faint-hearted. You will feel exposed and uncertain, you will have to find a way to remain in control when things are happening that you have no control over. How can a coxing experience be compared to being a leader in business? Well, as a leader, you will experience moments of very high pressure too. You will feel exposed and uncertain, you will have to find a way to remain in control when things are happening that you have no control over. You will need to have an awareness of the market, the competition, your clients’ needs and all the time, you will need to have a vision of success and guide your team confidently and cleanly through. You are going to be heckled and you will receive unsolicited advice, maybe even experience aggressive behaviour from others. Leading is not for the faint-hearted. Here are three ways to stay focussed even when there’s a lot of pressure to perform and things aren’t going your way. Why are you turning up for this? Whether it is a meeting, a presentation, a day in the office, training. Why are you there? This is a different question from: What are you there to do? For instance, if you are there to chair a meeting, that is what you are going to do. But most importantly, Why? What must come out of that meeting? That is where to focus your attention, particularly if you’re feeling stressed. When I sit in the cox’s seat, my job is to steer the boat and navigate. But Why am I there? I have one purpose. To optimise the speed at which the boat travels through the water for a specific period of time. I am there to use any method or strategy available to me to achieve that aim. That means I have to ensure the boat runs smoothly and efficiently, tension in the boat slows it down. The work has to be distributed in a way that will optimise the energy of the crew, I have to find ways to maximise the effort through the water and allow the crew to recover between strokes. Task: Ask yourself right now, ‘Why am I here doing this specific task? What is my real purpose?’ What is the best outcome in this situation? Know what the plan is and communicate it to your team. If you just expect them to do their bit, that’s what you will get. People doing what they know in ways that feels right to them. But as a Leader you want more for your team. You want them to be invested, to be upping their standards, to be working as a cohesive team. You want them to feel like they are learning and growing and you want them to know just how much their contribution matters to the greater picture. You want high standards and must believe that they want that too. When a rowing crew goes out on the water, they perform better when they know what they are trying to achieve from the outing. As a cox, I communicate with them throughout the session, whether in training or racing so that they know in advance what is expected of them at each stage of the outing and they can prepare themselves mentally and physically. It is my job also to set the standards and expectations. Sloppy rowing not only looks rubbish, it makes it harder for everyone in the crew to row. The cox sets the standards and holds the crew accountable throughout. If I accept sloppy standards from just one rower, it brings the level of performance down for the whole crew and makes for harder work. Good discipline prepares the whole crew to respond positively during those high presssure moments when they come. Task: How good are you at communicating? How does that change when you are feeling under pressure? What one thing can you do differently that will give your team even more clarity whatever the situation? There will be times when you need to make a change to the performance of a team member. It is much more effective to do this by outlining what you want to achieve and identifying with your team member the specific changes required. Several small and incremental changes over a short period often have more impact than trying to change too many things in one go. When working with a crew, the most useful comments are those that explain the desired outcome and what specific change you want to see. It is also really important to acknowledge the success of each small change and anchor it by focusing the crew or crew member on feeling the difference the change has made. The least useful call is one that asks the crew, or crew member to stop doing something (eg: stop rushing) It is unhelpful. It should always be replaced with what you want them to do instead, clearly and concisely. Task: How do you currently go about changing behaviour and upping the standards? What one change could you make today that would make your Leadership style more effective?